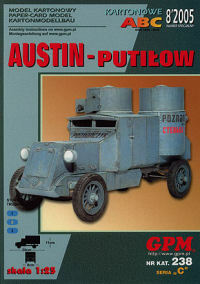 The Austin Putilow is an Russian armoured car from WWI.It looks kind of strange,but it grows to be looking really nice as the build goes on.The weathering on this model is very very nice,and all parts have 100% fit. The tires on this one was looking kind of difficult at first,since I had to make spokes of paper....but when I had done some thinking things got nicely in place. First step is to cut out the ring that will be on the inner side of the tire. Ring is glued to 0,5mm karton and cutted with the Olfa circle cutter. The top ring in place And I used some grinding paper to break the edges.The tire is now ready for the other side, the tire pattern and the paintbox The tire is done... Next is to put on some paint and dust.... The tiresides was also a new way for me to do wheels. As we can see from the drawings the sides are built up of 3 parts.They are buttglued to each other.Two are coned and the outer lies level on top. Adding details Turret inspection Mounting the headlight Model is finished!! This was a very fun build! All parts fitted 100% The model has a vey nice weathering and even in it's uglyness it looks very good! !